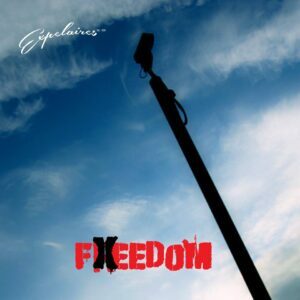 Expelaires’ Feedom album it now released after 38 years! Here’s Sophie Luchinsky’s album review. Expelaires – post punk band from Leeds now released their album on August 15, 2016 called ‘Feedom’. Formed in 1978, split up in 1981 and re-formed 2012 – it took Expelaires about 38 years to make this album. ‘It took us a while to make it but we are very chuffed with it.’, – Paul “Grape” Gregory tells. – ‘makes a good little tale.’. ‘Feedom’ album basically is post punk sound album with an excellent guitar riffs, beautiful solos and fantastic vocals. ‘The l.p title is an indication of how our freedom seems to cost more these days/everything our protectors do for us has a price and we are constantly monitored living our democratic lives.’- Paul “Grape” Gregory says. Paul “Grape” Gregory who wrote mostly all songs tells about Expelaires’ new album. ‘We try to put a message in all our stuff’, – Grape says. “Summer Riots” – written by David “Wolfie” Wolfenden is a fast full of energy song with excellent vocals. ‘Summer Riots demonstration of a feckless underclass while their “betters” help themselves to booty while doing “nothing illegal”’, Paul “Grape” Gregory says. The next track “It’s Alright Mother” – one of the songs from session of 4 tracks for John Peel “Nasty Media”, “Its Alright Mother”, “Frequency” and “The Dashboard (killed me)” ‘it’s great to live on your own and be responsible for your life if there’s a safety cushion to fall back on…’, Grape tells. ‘punk rock squats, the dole and drug addiction’. Lyrical song and slow song “Conspiracy” – has a nice guitar background with post punk rhythm. “(the) Dashboard (killed me)” – catchy fast song with blazing guitar Dashboard is about ‘slowing down and rubber necking at an accident then being in an accident because of it’, – Grape tells. ‘(the verse is the first part the chorus is the horrified second part)’. “Wall Of Sound” – written by Mark Copson is a true post punk sound, beautiful vocals and nice lyrics. The song is about Rock’n’Roll and a glorious noise with a bit of rebellion. Another song “Waiting In The Rain” – started with an excellent intro the song has a beautiful guitar sound receding into the distance. Brilliant melody in combination with great lyrics – the song is about the young generation standing in the wings waiting their turn. “Blue Street Dream” with fantastic intro, great background and excellent drums, Blue Street Dream – a story of “Headingley and how we used to prepare for our nights out and the events and people we met (the middle spoken part is a tale of how Mandrake was gathered)”, – Grape says. Fast rhythm song “Poundlad” is about a young person leaves a job on Friday then returns to the same job on Monday as part of the Workfare scheme. ‘A bit simplistically put but a reflection of how our government works to beat the working man down’, – Expelaires. Great song “Scars” with exciting intro, slow and beautiful background guitar “Scars” – is a short story of an unhappy upbringing and an inability to communicate resulting in self harm as Expelaires tells. Starting with beautiful vocals, then thrilling guitar, catchy rhythm, great lyrics “Respect” song is about ‘paranoia and misunderstanding leading to crazy standing up for oneself’, Grape tells. And the last track “Nasty Media” – starting with amazing guitar intro, fast vivid song with great lyrics – makes the song one of the best in the album. ‘”Nasty Media” is a short story about how the press/TV etc is corrupt….written in 1979! !’, – Grape says. All in all ‘Feedom’ is a brilliant real post punk album worth listening to. The next Expelaires gigs will be on Weds 14th September Brudenell Social Club Leeds, Sat 24th September Alzheimer’s Fund Raiser, Ilkley, Sat 1st October Team Sober MCC “Soberfest 2016” Festival of live music to raise funds for Air Ambulance, Leeds, Sat 15th October The Primrose Leeds. Sat 29th October Dark Wave alldayer, The Tivoli, Buckley, North Wales With: Theatre of Hate, Danse Society, Skeletal Family, Thurs 10th November The New Roscoe, Leeds, Fri 11th November The Packhorse, Leeds Opening night of the Leeds Goth and Post Punk Festival. Exepelaires official website is: www.expelaires.com. They also are on Bandcamp. All words by Sophie Luchinsky. More writing by Author’s Name can be found at her author’s archive.